Juniper (juniperus communis). Image by Peter O’Connor. As we’ve seen elsewhere, saining can be done in a variety of ways and one of those ways is using menstruum – water that’s come into contact with silver, gold, or spittle – which is then sprinkled about the place. Another way to perform a saining is with juniper (and water), as described by F. Marian McNeill at New Year’s. 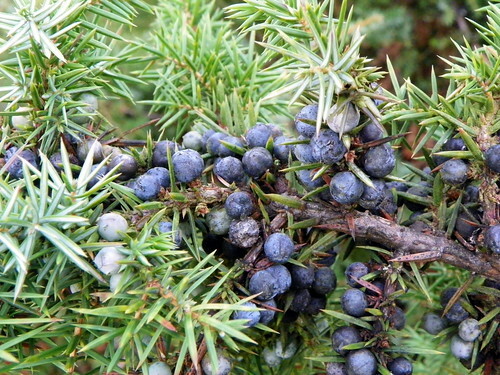 The “Juniper and Water Rite,” as McNeill called it, involves collecting a large amount of juniper and some special water – collected from “the dead and living stream”1 – the night before. The next day, everyone in the house prepares for the ceremony, stuffing up any gaps, crevices, and holes around the house to make sure that the smoke from the juniper will be well contained. The people then gather together and each takes a sip of the water that has been specially collected, and the rest of it is sprinkled about the place, concentrating on the four quarters of the house as well as the beds. The juniper is then place on the hearth and the copious amounts of smoke that is generated from the burning plant is allowed to fill the space as densely as everyone can manage. Once the smoke has done its work, the doors and windows are opened, allowing the space to air out, and everyone goes out to clear their lungs. According to other sources, we find that the water and the juniper are supposed to be collected under special circumstances, observing certain conditions and saying certain prayers. Alexander Polson describes the same rite being used to try and cure a young woman of an illness whose cause was suspected to have been from witchcraft or the evil eye, and the water was collected in total silence, at midnight, and the collector was careful to make sure that they didn’t look back at any point, or allow the vessel of water to touch the ground at any point. Traditionally the whole juniper plant was supposed to be ripped up and brought home, but if we’re going to perform the rite in a contemporary setting, that’s just not possible or advisable these days. Juniper is a very slow-growing plant and it’s endangered in the wild; it would be damaging to the environment (and illegal) to collect a plant from the wild, and beyond wasteful to buy an endangered plant from a garden centre for the express purpose of burning. Instead, it’s better to grow your own juniper if you can and collect a token amount as needed, making sure that the plant itself is unharmed, or – in a pinch – perhaps use juniper berries that you can buy in store. For the water part, it might not be a good idea to drink water you’ve collected fresh from a stream. If you have no way of purifying it and guaranteeing it’s safe to drink, try substituting it with spring water instead. Prepare/collect the juniper and water the night before your saining takes place, if possible, though personally I don’t find any harm having some in stock for whenever it might be needed. While I’ve given an outline for each section as described by McNeill and Polson, for the sake of completeness, I don’t always run through the whole thing; on a day to day basis, I might prefer to just do a shorter version (below), where I only burn the juniper. As part of a longer ceremony (e.g. festival celebrations) I tend to adapt the rite into the proceedings, so I might no bother with the opening section. As always, and most importantly, this is just a suggestion of how it could be done, not how it should be done. Leave an offering of thanks to the spirits of the plant before leaving. The water of the “dead and living stream” is supposed to be collected in a “clay crock,” and “you must not open your mouth to person nor to animal nor to any created thing from the time you go away till the time you return home. On the lower side of the bridge on which the living and dead go across, you shall go on your right knee, and you shall lift a palmful of water in the hollows of your hands into the crock…”4 So the whole process should be done in complete silence. In the name of Brigid gentle-woman. Leave an offering of thanks to the spirits of the burn before leaving (if applicable). Fàilte ort féin, a Bhrighde! Mar a thogadh Brìghde féin. As Brigit would raise hers. Thanks to you, always, and praise to you forever. Beannaich an taigh agus a luchd. Bless ye the house and all therein. O ghoimh, o ghiamh, o ghnìomh, o lochd. O Brigit shield the house, the household. A sgéith dhidinn, dìon ri ‘r mairionn. Air an oidhche nochd ’s gach aon oidhche. O shield of protection, guard us forever. Keep repeating until the space has been thoroughly covered. 1 The dead and living stream (or ford) – a crossing point over (or through) water where the dead and living both pass. Traditionally funeral processions used their own roads and routes to bring the dead to wherever they needed to go, so the only points where the dead and living would meet would be at bridges or shallow crossing places at streams and rivers. 2 Black, The Gaelic Otherworld, 2005, p231. 3 See note 2, and also Carmichael, Carmina Gadelica Volume IV, 1941, pp128-129. 4 Carmichael, Carmina Gadelica Volume IV, 1941, p163. 5 I don’t think invocations are necessary (or polite) so I don’t do them, but in formal ceremonies I think it helps to acknowledge a connection with the deity or deities you’re speaking with, reaching out to, communing with (or whatever else…). I see the lighting of the flame as a way of making a connection or conduit, maybe, so that’s a good time to say hello and make a conscious attempt to reach out and connect. Based on Song #83, first verse only. Adapted to Brigit instead of Mary, with cairn (a transcription error on the Sacred Texts site) corrected to caim. Carmichael, Carmina Gadelica Volume I, 1900, pp222-223. 6 The Gaelic that’s given here throughout is, over all, my own composition, using language and phrases that’s been inspired by many of the prayers from the Carmina Gadelica (mainly volume 3).